Official website of author Amy Sparling: Amy's Mega Christmas Giveaway! I wanted to plan a Christmas giveaway for my readers but didn't know which book to giveaway. Well, when I asked everyone for their favorite book of mine, there was an overwhelming answer of The Summer Unplugged Series. So I figured, why not, and I'm going to give away signed paperbacks of THE ENTIRE SERIES to one lucky winner! It would be $111 to buy them all on Amazon, but you can win them here! Woohoo! 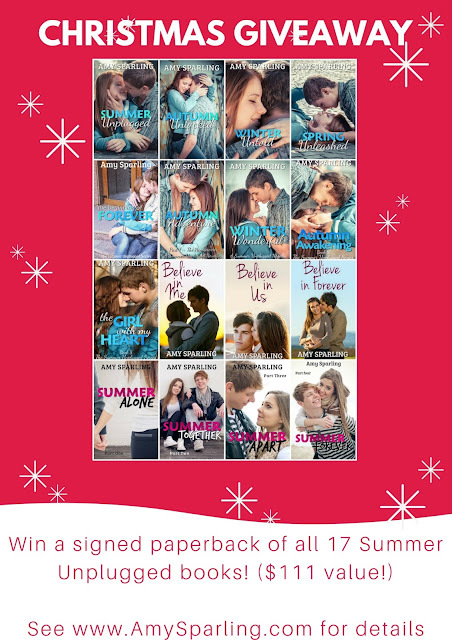 Because I love you all so much, I'm doing two giveaways for many chances to win! The Grand Prize winner will get all 17 books in the Summer Unplugged Series, but 5 other secondary winners will get one paperback of their choice, signed, plus bookmarks from me and other authors. Fill out the Rafflecopter form below and you'll be entered for both the Grand Prize and the secondary prizes. Winners will be chosen on 12/25/2016 and notified by email.